The reigning UAAP Season 76 MVP and certified college volleyball champ Miss Alyssa Valdez will be making some appearances on GMA News TV Channel 11 and GMA Channel 7. At 2PM, Alyssa together with the rest of the Ateneo Lady Eagles will have a game against the Adamson Lady Falcons in Shakey's V-League Season XI. 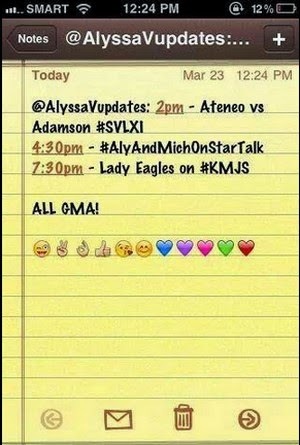 And right after that, at 4:30 PM Alyssa Valdez and Michelle Morente will be appearing on GMA Channel 7’s Startalk show. And finally, as an icing on the cake, at 7:30 PM the Lady Eagles will be featured on GMA Channel 7’s Kapuso Mo Jessica Soho.